STEM seems to be a buzzword these days but that doesn’t mean that you should run from it. Science, tech, engineering and, math were words that used to scare me because growing up I wasn’t taught that these things could be fun. 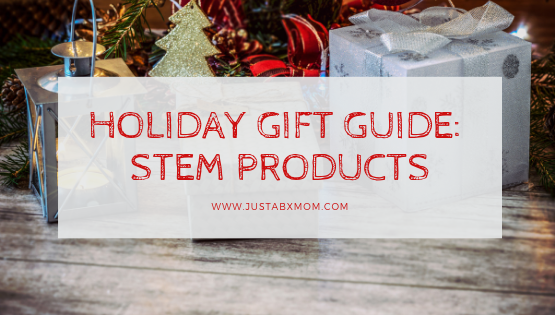 Today, STEM products are at the top of many of our littles’ wish lists because they know the secret that we didn’t, STEM can be so much more than what you read in a textbook. To prove that point check out these items that will be sure to bring smiles if you’re little one unwraps them. The Magic School Bus Rides Again Science Kits – Have you and your littles checked out the new episode of The Magic School Bus? Miss Frizzle’s sister Miss Frizzle has taken over the classroom adventures for her but they are just as magical as ever. And now the fun can be brought to life at home with The Magic School Bus Rides Again Science Kits. The Young Scientist Club has developed a dozen new kits that are all gender neutral and come with a number of experiments. MiBro – In 1985 I remember a robot friend being released and I also remember not being able to get it. It costs about $200 and really didn’t do much. We’ve come a long way since 1985. Now, MiBro is a pint-sized robot friend that plays with your little, can play pranks, serve as an assistant by transporting things on its tray and more. What would you do with your own MiBro. Oh, and it doesn’t cost $200! Klutz – Make Your Own Discovery Bottles – These are so much fun. We first made discovery bottles over this summer and had a wonderful time both in the creation and the playtime that came after. This set includes a book that gives you six different experiments to attempt. It also comes with two leak-proof bottles to bring the experiments to life. Will your little prefer creating a tornado or a galaxy? GeoSmart Flipbot – My little loves to build. This magnetic construction set includes turbo motors that bring their creations to life. The set even comes with a remote control so once you build your bot you can control where it goes. With thirty pieces in the set, I can’t wait to see what JustaBXgirl creates. Mr. Banks – It is never too early to introduce financial literacy to our littles and it is important to connect our littles to understand that money is math!!! Now isn’t that a great way to garner interest in math? Mr. Banks is a fun way to get your littles into saving and counting their coins. Then start discussing how Mr. Banks works and categorizes the coins. Tech Will Save Us Sew & Glow Kit – I love when you can connect different subjects for littles. My daughter loves tech and fashion so this something she would love. It includes a variety of templates to help you mini designer create light up pins.